2 by 3 Heroes: And then there were four. The Pierce Project is in the final stretch. The newest addition is the poorest condition card of the set. However, with the prices I have seen for this card, I could not pass, even if it is creased. 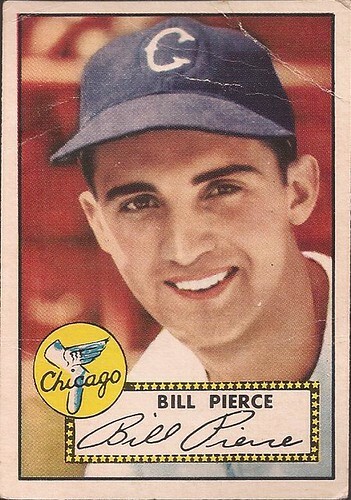 I give to you, the reader, the 1952 Bill Pierce. This appears to be the same image as on Billy's '51 Blue Back, just tilted slightly. One thing I notice from both images - the logo C on the cap is an oval patch and not a chain stitched or felt sewn letter. Cost on a 61 year old card - under $4 delivered.